In Australia, people like to spend their big portion of earnings to purchase costly furniture such as antique or modern furniture to improve the beauty of their house and living pleasure. But it may be challenging and chaotic for you to handle all these expensive furniture items especially on the day of moving. So, you need to have some well-organized plans to make such furniture removal process smooth and convenient for you. You can also keep yourself tension-free from all moving headaches by hiring the professional and skilled furniture movers in Canberra. If you have decided to handle all your furniture moving job by yourself, first you must understand that it involves great risks and challenges. So, you should need to move your delicate furniture items and antiques carefully and in a proper way to ensure that it remains intact without any damage while moving. Plan ahead to get rid of unnecessary items to have less number of items for easy moving. Make a list of all unnecessary items in advance that will help you in reducing your luggage size and in turn fewer trips and lesser cost of moving. You can make shifting a lot easier and smoother just by making an inventory list of all your moving items. This can also help you in making a budget and stick to it. Here, you need to consider various factors, such as the costs of materials, moving the stuff hiring a moving company or DIY, and any unexpected expenses that may pop up. Therefore, if you learn to plan ahead and well, you’ll surely end up with more bucks in your pocket than expected that will bring as a welcome surprise for you after the move. Also, plan and book your removal date in advance to analyze exactly how much time you left and when you need to start doing the job. All your fragile or delicate stuff should be neatly packed in the proper boxes and also mark them as fragile to ensure that everyone should know they’re fragile. A box with a label also allows someone other than you that it needs to be handled carefully. So, it is always helpful to label each box to let people know about its contents. While moving furniture or any other delicate and heavy item, always try to lift from the knees to avoid straining your back. When heavier items are concerned, use as many people to help you lift and move the item. Always move slowly and carefully to make sure there is a clear path before you. Before moving your item ensure that small furniture pieces, children, and pets are out of the way. I hope, you can get great help by using all the above useful tips while moving your delicate and costly stuff. 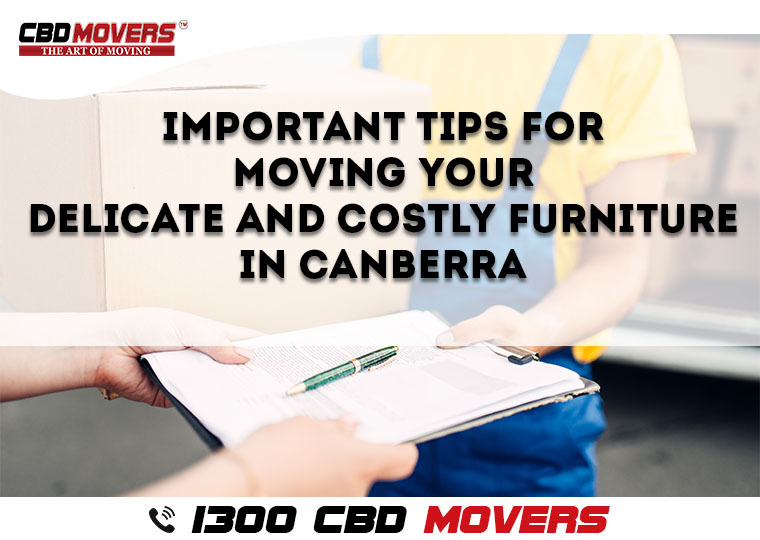 If you still find it difficult for you to handle the stuff safely then don’t hesitate to recruit the trusted furniture movers Canberra, like CBD Movers. Our skilled and dedicated team of furniture removalists in Canberra ensures that your furniture stuff will remain in the safer hands and the moving process will go as smoothly as possible. Previous PostPrevious A joyful customer from Mount Barker, SA is sharing her great experience with services of CBD Movers™. Next PostNext How Can Professional And Reliable Furniture Movers in Canberra Make Your Moving Job Less Stressful?